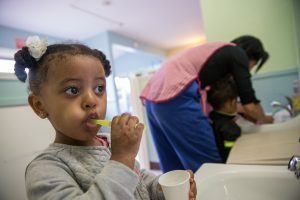 Because a healthy child is ready to learn, children in Head Start receive comprehensive health services, including immunizations, physical and dental exams and treatment, and nutritional services. We encourage and support families along the way, assisting them in obtaining the proper medical care and in following medical recommendations. Our agency conducts various medical screenings such as vision, hearing, anemia, and height and weight measurements in order to identify and address all potential health concerns. If your child needs to take medications during the school day, a written statement from the doctor is needed. You will also need to complete an authorization to administer medication form. 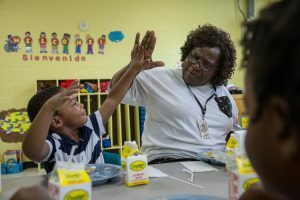 Nutrition is part of each child’s learning at Head Start and takes place throughout the day. We serve nutritious, unprocessed, safe foods prepared in kitchens inspected by and complying with Champaign County Health Department regulations. Head Start centers participate in the Child and Adult Care Food Program (CACFP). attending during the afternoon will be served lunch upon arrival and an afternoon snack. eal accommodation in place prior to your child attending class. In order for that to happen, we ask you to share your child’s needs right away and obtain documentation from your child’s doctor noting the allergy/intolerance and appropriate substitution. Your child may not attend class until we receive the doctor’s statement and the special meal accommodation plan is completed.